NAKURU, Kenya, Feb 2 2012 (IPS) - Using 140 characters or less, Chief Francis Kariuki in Kenya, has tweeted his way to reducing crime in his and surrounding villages. Kariuki, who is from Lanet Umoja Location, a semi-urban area in Nakuru County, Rift Valley Province, first began tweeting in May 2011 when local IT expert, Njoha Gathua, created a Twitter account for him. It was an innovative idea because to date, Lanet Umoja is the only semi-urban area in this East African country that uses this social media site to fight crime. Gathua told IPS that he wanted to help the community reduce crime, so he gave the chief and his assistants training on how to use the free instant messaging tool that limits users to post or tweet messages that are a maximum of 140 characters. “Twitter is good to broadcast messages to the mass. It is good for the chief and his assistants to pass messages to their people,” Gathua explains. But while worldwide people and companies mostly use it to keep in touch with friends, market products, and to broadcast breaking news, Kariuki uses it to alert his villagers to crimes. Using the Twitter name “@chiefkariuki“, Kariuki sends messages to over 15,000 of the 28,000 people who live in Lanet Umoja. They include village elders, community and church leaders, the police, youth and women’s groups, and school principals. When an incident occurs, the victims or eyewitnesses send text messages to the chief, describing the nature of the incident, the place and the nearest known landmark. The chief then broadcasts his instructions to the community through Twitter. While not everyone has 3G-enabled cellphones here, many just subscribe to follow Kariuki’s account through their local service providers and receive his tweets by text message. When the chief sends out a message, in a matter of seconds the entire location goes into action as directed. “If the chief’s message is about robbery, we come out in large numbers. As other residents move to the scene of crime, others block all escape routes, especially for carjacking and livestock thefts,” David Waweru, a village elder, says. The messages, which are either in Swahili or English, are short and straight to the point. In November 2011 one message in Swahili read: “Kuna mzee ndani ya chimo Umoja 2 area, tume ongea nayeye na simu lakini mteja sasa” (There is a man in a pit latrine in Umoja 2 village. We spoke to him on phone, but he has gone silent). The chief led the villagers to action, and they worked the whole night to find and free the man. 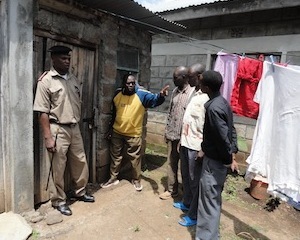 “We didn’t know his name or the latrine he was in,” Kariuki told IPS. Five hours later, the chief tweeted: “Tumempata sasa yuhai, asante” (we have found him alive, thank you). The man, John Muiru, fell into an unused 20-foot pit latrine at night, and he called a village elder for help. At the time of writing Muiru was still in hospital. In the old adage of more hands make light work; working together the community are sometimes able to solve crimes quicker than the police. Last year, when a car was reported stolen from the location at 5.10pm, it was found at 12.50pm, the same nights. When livestock was reported stolen from a local farm at 4am, the animals were found with the help of the community four hours later. And when a little boy was reported missing on his way home from school at 8.04pm, he was found half an hour later after losing his way home in the dark. “Lanet Umoja 2 village was a no-go zone from 6.30pm 10 months ago, but since the chief introduced his Twitter technology, we have no problems,” Geoffrey Mbuthia, a resident of the location, says. Kariuki also uses Twitter to convene meetings and make announcements for Kazi kwa Vijana, a government project that aims to create jobs for the youth. He also sends spiritual messages to his villagers. The chief says though he has succeeded in bringing down the level of crime in his location, he still faces challenges from criminals and illicit brewers. Some of the criminals also follow him on Twitter and are warned of his crime alerts and if the community mobilises to solve a crime. Professor James Gatoto, Director of Nakuru Town Campus at Kenyatta University, told IPS that Kariuki’s use of Twitter was innovative. “This is a good development to come from an African village, ” Gatoto says. “Twitter is a powerful tool to disseminate information, and to mobilise people. Kenya needs such tools to unite the various communities in the country to live together peacefully, to avoid a repeat of the 2007 /2008 post election violence.” Gatoto, a Mathematics professor, uses Twitter to communicate with his students. But he warns that if left unchecked, social media can be harmful as people can use it negatively to spread hatred. But meanwhile, the chief of Lanet Umoja location will still use Twitter to fight crime.